Spring is around the corner, which is exciting. I can't wait for our trees in the backyard to bloom so they can set the scene. 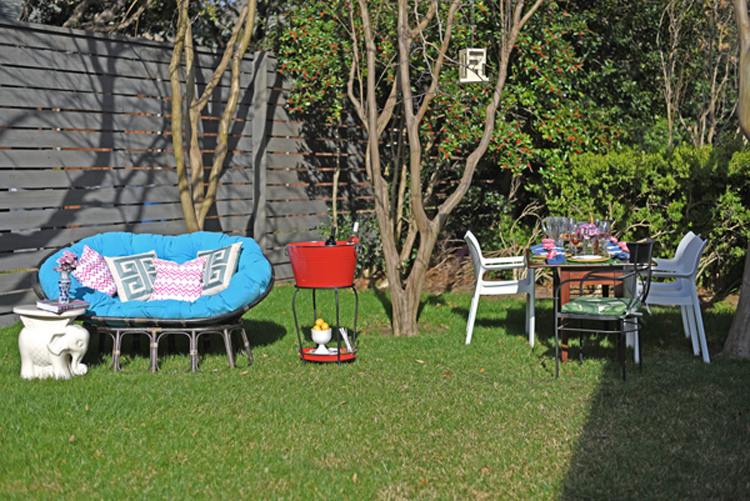 One of my goals this spring is to make our outdoor space cozy and inviting. 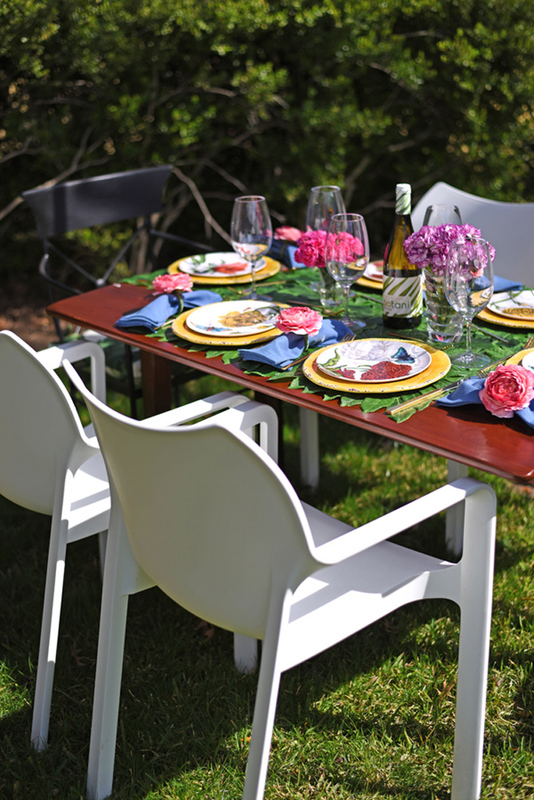 I have partnered with Pier 1 to show you how, with a few fabulous quality things, you can add a pop of color and coziness to your outdoor space for inspired gatherings with friends and family for the upcoming warm-weather months. 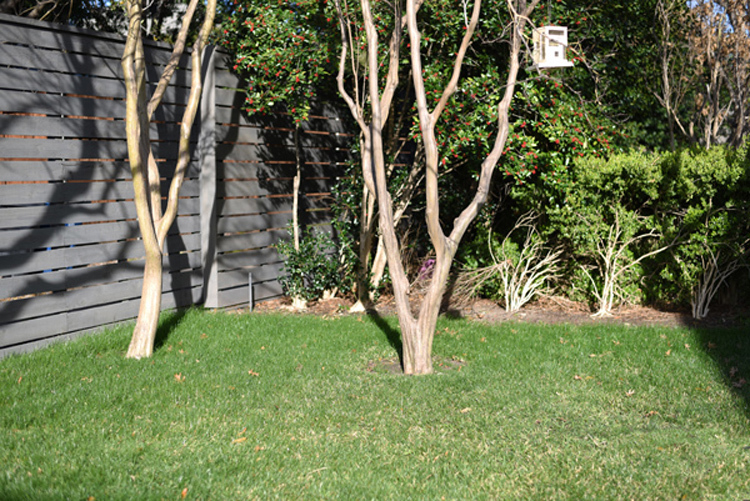 This is what a corner of my yard was looking like before- a little bare and lonely. Not anymore! With the help of Pier 1 I turned it into a welcoming corner. See? 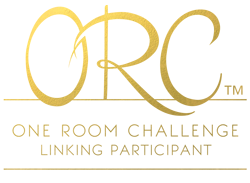 Let me share with you the details. 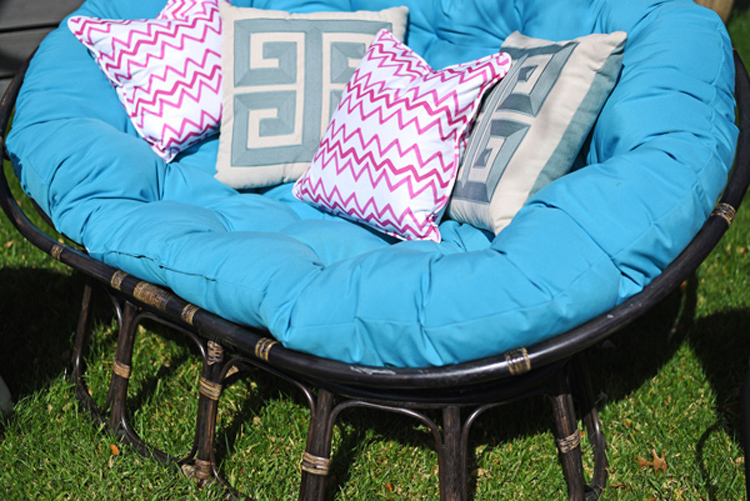 First off, this bright blue papasan chair is the most comfortable piece ever. I love sitting out here to enjoy the sunshine and good company. I have even taken naps out here on a lazy Sunday! The Greek key pillows are from Pier1 as well. (I got those last year and, unfortunately, they are no longer available. But they have an amazing selection of other beautiful pillows for you to choose from.) My favorite item has to be the white elephant. I'm kind of #obsessed with it, and I wish I had a few more to set all around the yard (and even inside my home!). 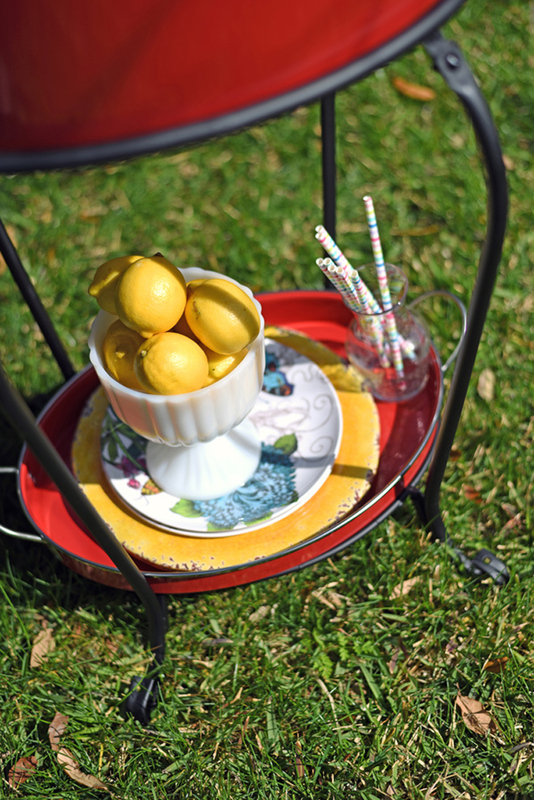 It adds that pop of personality, and is the perfect accent table. Don't you just want to grab a book and lay there all afternoon? This red cooler is a lifesaver. It is so convenient! I no longer have to go in and out of the house to get drinks. 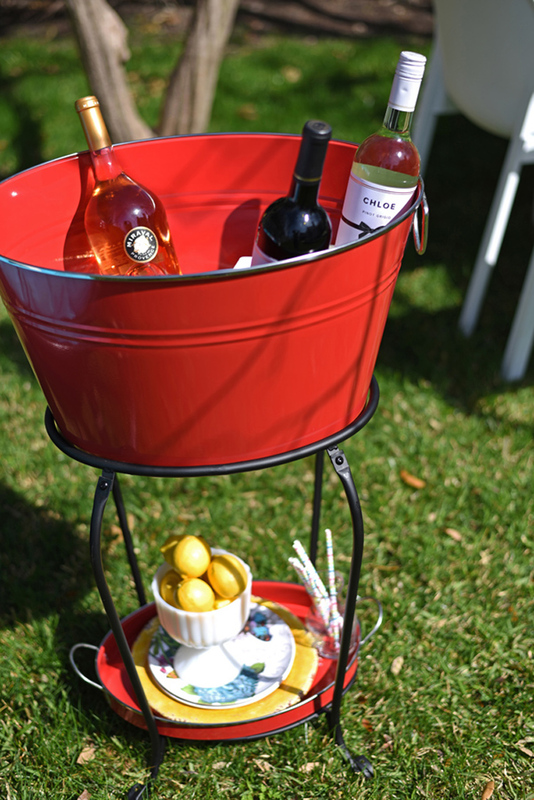 It holds our favorite wines, waters and refreshments. I keep any other bar essentials below. For me, gathering with friends around a table is the best part of any evening. And I do love setting a beautiful table. I can let my imagination run wild with all the fun tabletop choices Pier 1 has. 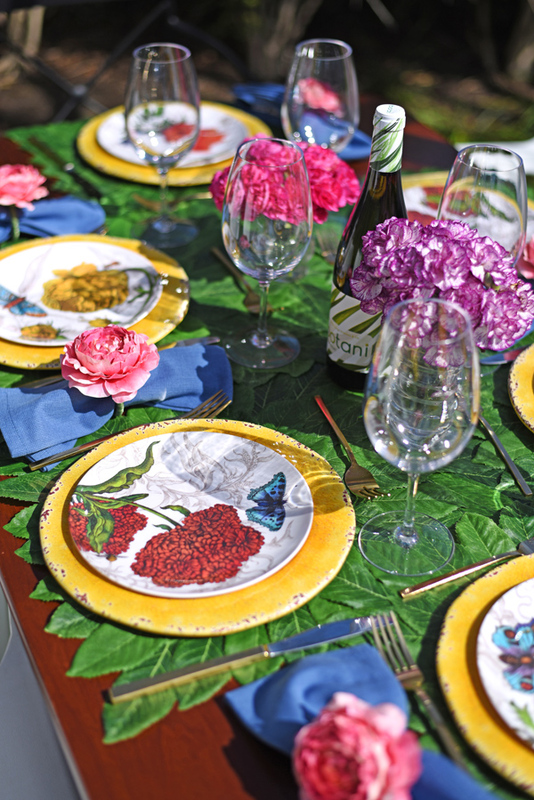 These floral salad plates are so cute and happy (they are no longer available but these are very similar). 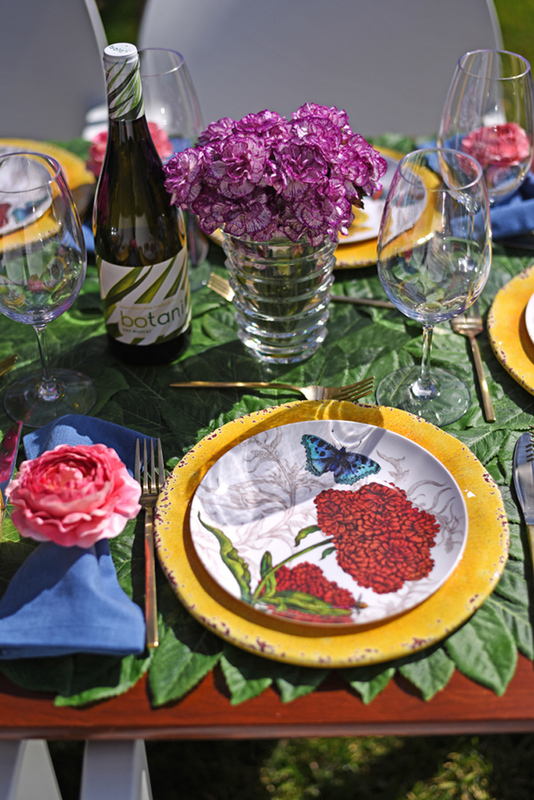 I loved combining them with the beautiful yellow plates. Oh, and believe it or not, they're both melamine! They don't look it at all, and this is so much better for any area around the pool. 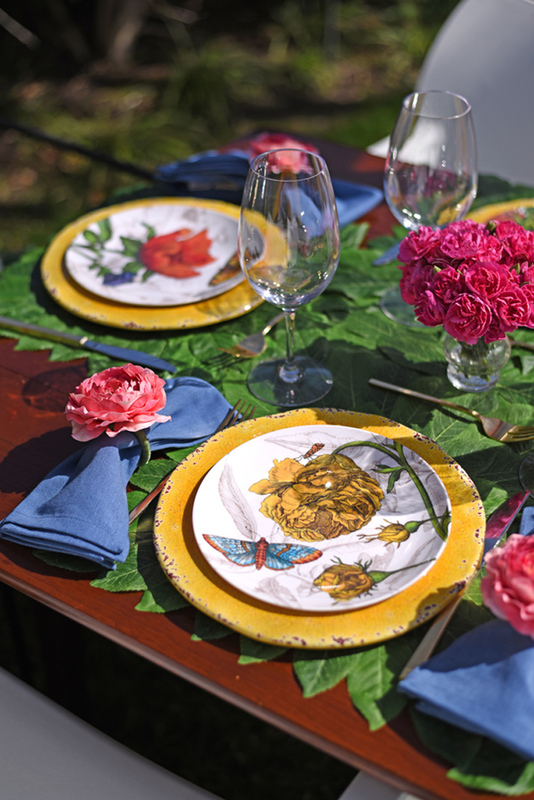 The blue napkins go with everything and are so practical. The wine glasses are plastic (which I find sensational! 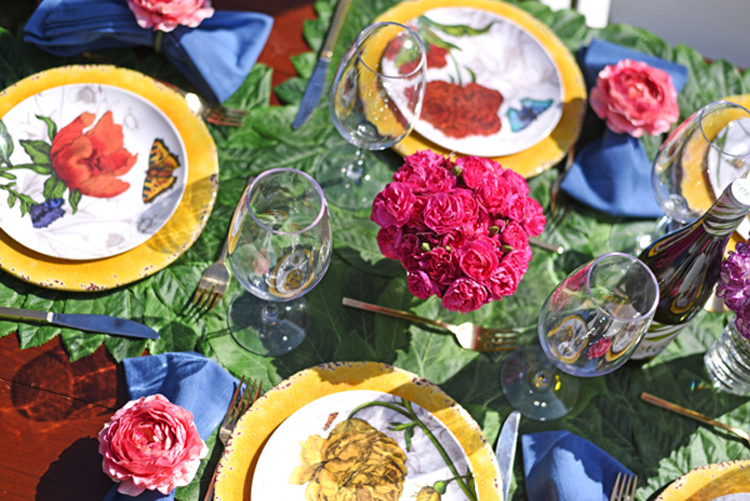 ), and my favorite part of the table is the leafy placemats and the floral napkin rings. We are thrilled with our transformed, cozy outdoor space. We are ready to enjoy the next few months out in our comfortable and happy corner. 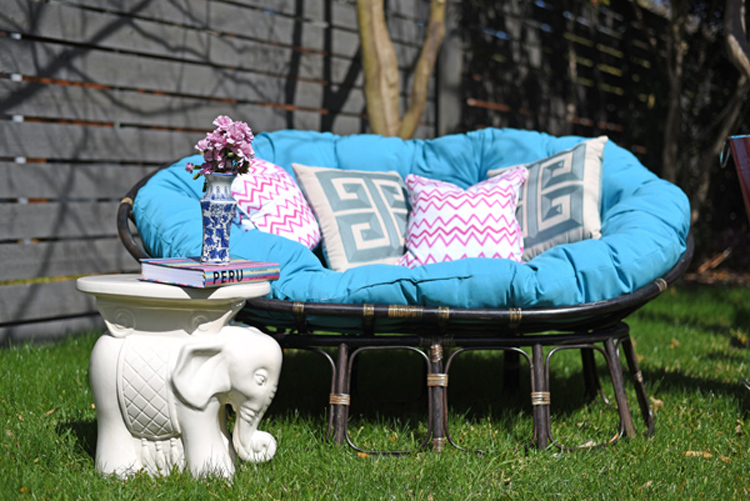 If you are looking to spruce up your outdoor space, visit Pier 1; you will get inspired and find the perfect items for your space! 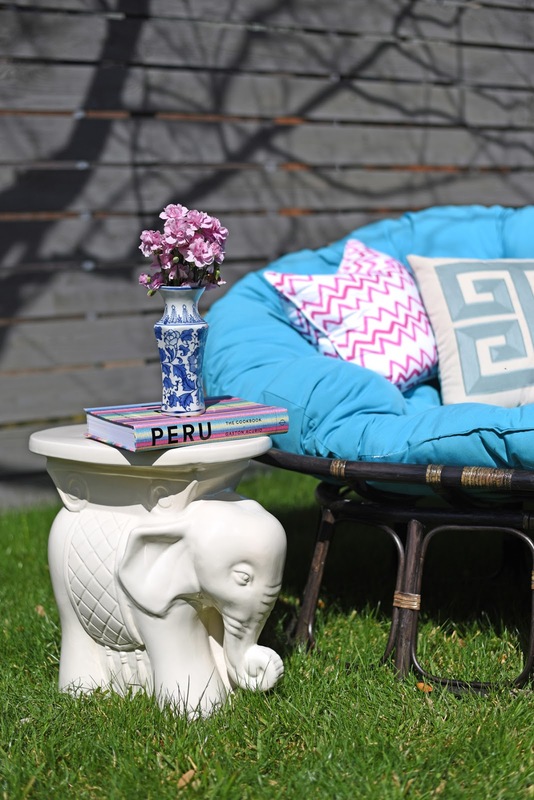 With hundreds of exciting new decorating options, Pier 1 will help you create an awesome outdoor space that you'll never want to leave. 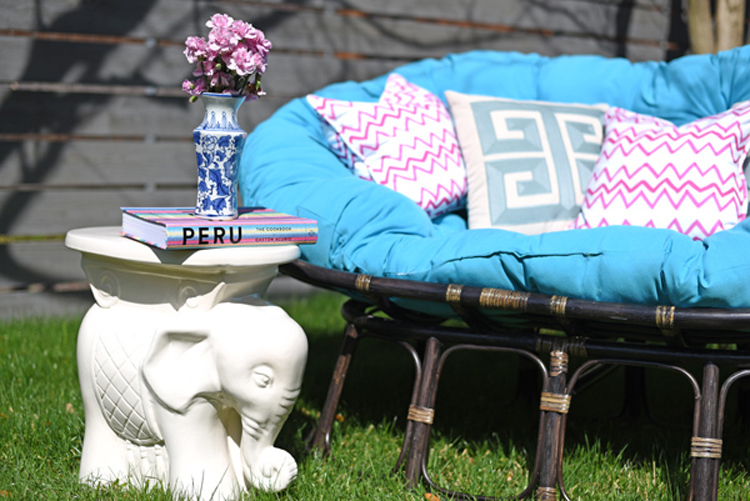 Explore their new 2016 collections here and remember to share photos of your Pier 1 decor on Instagram with #Pier1love. I do like many things at Pier 1, but as a designer I quite often find their items a little pricey. 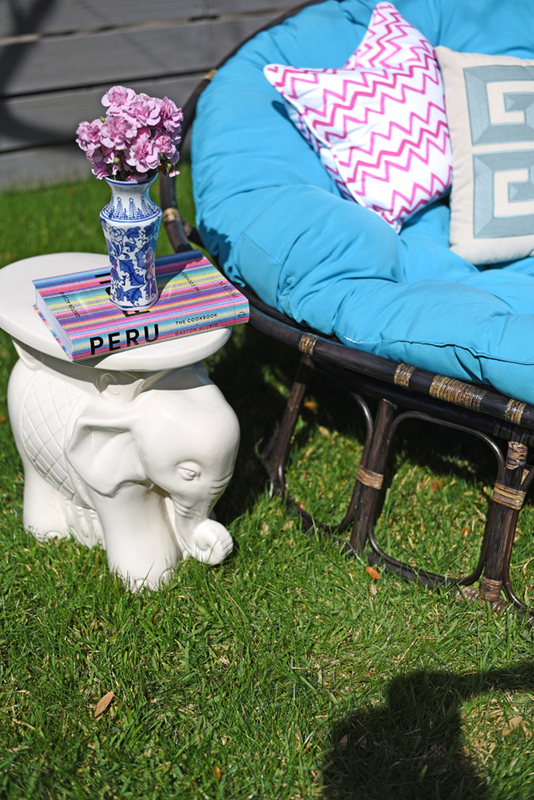 Love the elephant garden stool...maybe on sale. I love how you turned the space into an inviting place for entertaining! 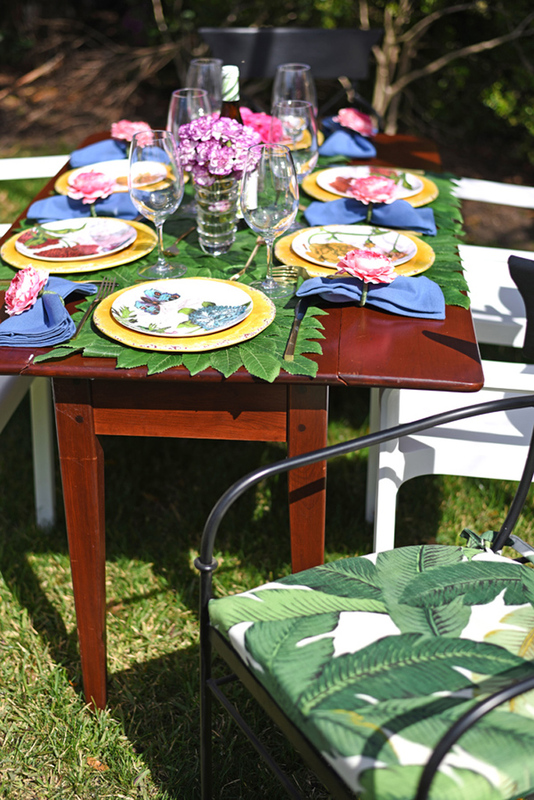 I love Pier 1's Outdoor selection! Beautifully done, fresh and bright! Adore Pier 1 and all they have to offer! I have a coveted ceramic elephant that has been enjoyed for many years!